Bencharongkul's Sad Beauty is a picture that delves into friendship of women, narcissism, spousal abuse, even murder, but it seems most notable (in this combination) for, as the title says, its beauty, a glamour and sensuality that's so strong even when a corpse is being fed to crocodiles, it's pretty. This somehow fits with the tropical magic of Thailand that's evoked by the country's most famous filmmaker, Apichatpong Weerasethakul. This is veteran actress Bencharongkul's second sortie as a director, and she seems to know what she's doing. This is a movie that's interesting and intriguing. It's an odd combination of elements, fashion shoots, a sordid beating and murder, a body disposal worthy of the Coen brothers with a touch of Patricia Highsmith, and then back to the night club scene where the model-failed actress Yo (Florence Faivre, well cast) looks glamorous even when she's bruised. Yo's best friend, companion and unpaid assistant is Pim (Pakkawadee Pengsuwan, excellent), who's smaller, seems younger, also more stable, but is sorely tested. Pim's diagnosis with serious eye cancer - following a club night and a steamy, sensuous shared shower - leads the two women to Pim's house, where her mother has been badly beaten, and the fatal confrontation of Yo and Pim with Pim's brutal, abusive stepfather takes place. The body disposal, requiring a trip to Pim's "uncle," her mother's ex-boyfriend, way up in the woods, is the central, most absorbing section in the movie. Sparse, Hemingwayesque hints at his remote house suggest he may have experience in combat and big game hunting, or maybe he's just a tropical he-man. But he's young. Though he's a total contrast, and not a talker, he plays the same role as The Wolf (Harvey Keitel) when Jules and Vincent accidentally have a corpse on their hands in Pulp Fiction. This is a hard act to follow, but one of Sad Beauty's best aspects is the assurance of its sudden shifts. Suddenly it's a year later but Yo and Pim, who had a bitter little spat after the corpse disposal (that was a long, tough night), are still friends. Pim has been having chemo. Yo is still making good money, but still has bad vibes in the business. She still is dissolute, has no purpose, is pursued by handsome guys after a good time, and now has nightmares inspired by that night of the crocodiles. 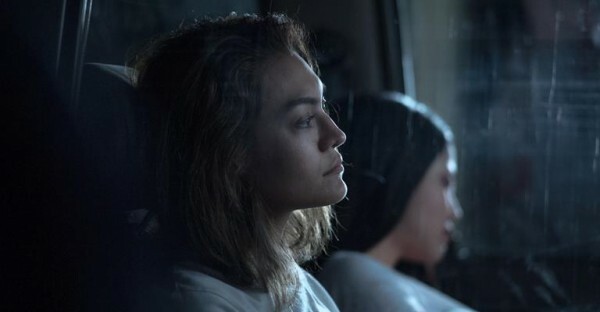 Gradually it sinks in that this is a woman's picture, centered on an intense, dysfunctional woman's friendship, in which the killing is forgotten and the greatest crime is the failure to be there for one's friend at the crucial moment. But this failure isn't without repentance. This is a female director who can handle film noir with its appropriate violence, but also delve deeply into the complexity of a women's friendship. The sensuousness also extends to things that are icky or disgusting, like the wrapped, seeping body and Pim's diseased eye, but also to a delicate handling of the lost friend that's sad without being sentimental. The Far East Film Festival 20 blurb points out interesting details about the film and the filmmaker. More known in Thailand as Tak Bongkod, or her acting name before being married, Bongkod Kongmalai (Thai names aren't easy!) Bencharongkul began acting at fifteen in 2000, the "early days of the New Thai Cinema era." She starred in more than twenty movies for Sahamongkol Film, including blockbusters, and has also starred in TV series. 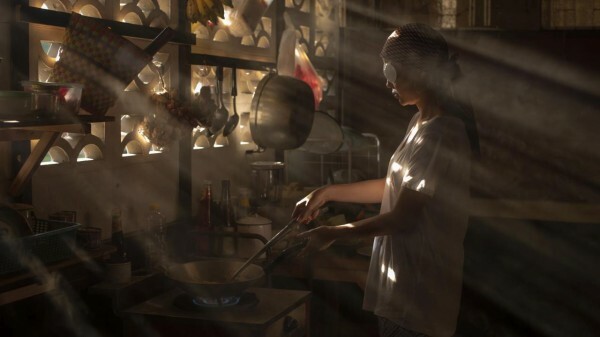 This film, her first as an independent writer-producer-director (fortunate position) benefits from cult film director Kongkiat Khomsiri for details of production. The writer suggests an expressionistic role in the camerawork, bird's eye view angles "perhaps to signify the patriarchal control surrounding the protagonists," and handheld camera movement "to stress the convulsive sensibilities and feelings of being female in Thai society." But that seems to me secondary to the way the images deliver beauty even at the ugliest or ickiest moments in the action - an effect that is both cloying and liberating. And beyond the style, this director has something important and heartfelt to say. An excellent and original film. Sad Beauty, 92 mins., debuted at Udine Apr. 2018, also Shanghai and Bucheon. Screened for this review as part of the 2018 New York Asian Film Festival, showing at the Walter Reade Theater on 14 July 2018 at 5 p.m.